Parallel analysis (Horn, 1965) is the most accurate method to confirm the number of factors/ components to retain in instruments such as surveys, however, the method is infrequently used. 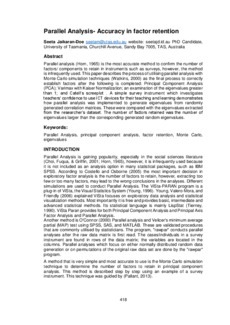 This paper describes the process of utilising parallel analysis with Monte Carlo simulation techniques (Watkins, 2000) as the final process to correctly establish factors after the following is completed: Principal Component Analysis (PCA); Varimax with Kaiser Normalization; an examination of the eigenvalues greater than 1; and Catell’s screeplot . A simple survey instrument which investigates teachers’ confidence to use ICT devices for their teaching and learning demonstrates how parallel analysis was implemented to generate eigenvalues from randomly generated correlation matrices. These were compared with the eigenvalues extracted from the researcher’s dataset. The number of factors retained was the number of eigenvalues larger than the corresponding generated random eigenvalues.